While “Hunza” is used to refer to the local region, in reality it is divided into two: Hunza on the north side of the river, and Nagyr on the south. Our plan for today was to head up the namesake Nagyr Valley to the village of Hoper next to the massive but accessible Hoper Glacier. Given mild concerns about the security situation in Nagyr we drove in a convoy of five vehicles, with a couple of policeman armed with AK-47s riding in the lead vehicle. Nagyr is predominantly Shia (unlike Hunza which is Ismaili, and the rest of Pakistan which is mainly Sunni), and some young troublemakers have recently been trying to stir things up. It didn’t feel that unsafe on the drive up, all the locals were just as friendly as we’ve come across elsewhere in Pakistan. The only sign of any unrest were a few of the ubiquitous “Down with USA” signs graffitied onto the sides of buildings, as well as many signs imploring the locals to “Join ISO (Islamiat Student Organization)”. My particular favorite was some graffiti that said “America Dog, Israil Pappi” – if you’re going to incite some hate, at least spell it right! Our drive took us from Karimabad, back down to the KKH and over the river, and then onto some rough dirt and partially sealed roads into the Nagyr Valley. The road quickly gained altitude as we got out of the valley floor and up onto the greener terraces where the villages are. It took about an hour of driving through some pretty spectacular scenery to get to Hoper, where we pulled in to the entertainingly named “Hoper Hilton”. It was a brief two minute walk from there to the edge of the cliffs which looked down onto the glacier 150m below. After rattling off some photos of the glacier pouring down from the shoulder of Diran, I was keen to be a bit more active so I took the opportunity to hike down to the edge of the glacier. A steep trail led down underneath the cliffs and terminated at the lateral moraine. I soaked up the views and the silence (no wind, just the clatter of small rockfalls every now and then) before turning around and hiking back up. After a gut-busting 20 minutes I was back with the group for lunch at the “Hilton”. I took another quick stroll along the cliff top before we left, and came across some children picking apricots off their trees and drying them on flat baskets in the sun. I gave a boy one of the clip-on koalas I carry around for small gifts and I made an instant friend: in return he gave me a quartz crystal he had in his pocket, scooped up a handful of dried apricots off one of the baskets, and also offered to pick me some fresh fruit off the tree. 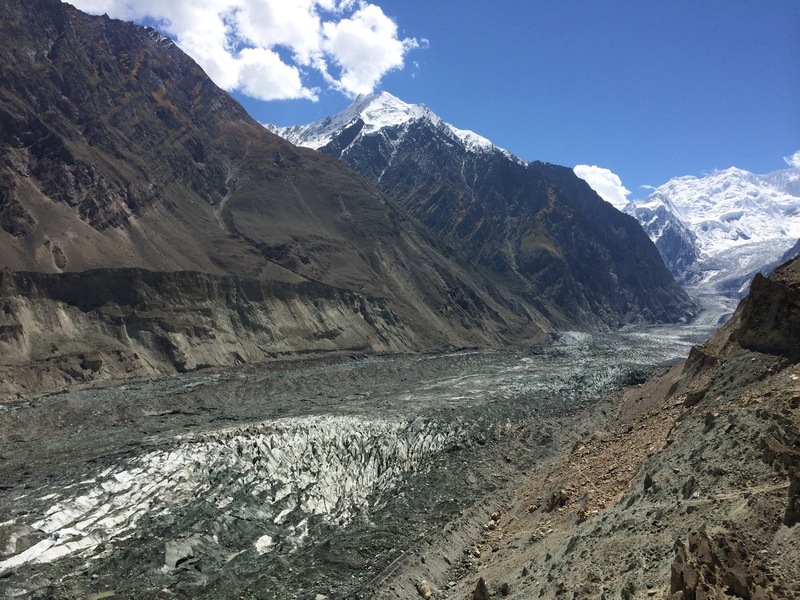 We were back in Karimabad by mid-afternoon, and I was keen to use the time until dinner to do some hiking. One of the locals suggested the Queen Victoria Monument on the hillside above the village so off I went. It took me an hour and a half to get up there, walking past the Baltit fort, through the old mud brick village and along narrow alleys, through the terraced fields and orchards following one of the water channels uphill, and eventually onto the steep hill slope to the top. The Queen Victoria Monument was nothing special (nothing more than a pile of stones) but the views over the Hunza Valley and up the glacier towards Ultar made the hike worth it. You did a good job, mostly people do not know about Nagar Valley, thanks for categorizing. Actually Nagar and Hunza are two separate districts people are unaware of this. As you say river is boundary between Hunza and Nagar which separates both districts, if you travel from Gilgit towards Hunza Nagar right side of river is Nagar Valley and left is Hunza and the very first village named as Chalt which is situated on the left side of river it is part of district Nagar. People of Nagar are very peaceful and hospitable. There is no any issue of terrorism, we welcome our gusts so please come and see beauty of Nagar Valley. Hisper Glacier, beside these many more eye catching places are here. You can come to us and visit these beautiful places and enjoy and see how hospitable the people are.